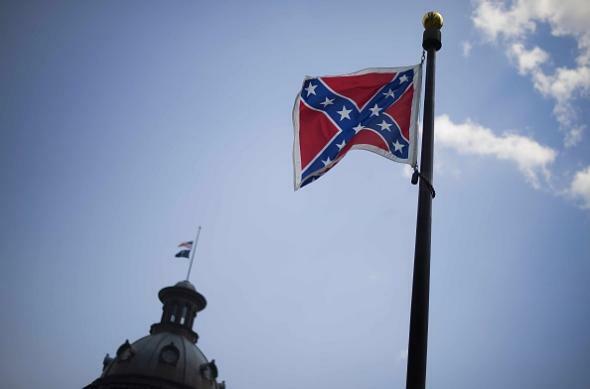 Confederate flag updates: Mississippi, Alabama, and other states address controversial symbol. The Confederate flag outside South Carolina’s statehouse. South Carolina legislators may respond to the June 17 murder in Charleston of nine black church patrons by removing a Confederate flag from the grounds of the state Capitol—although the flag was still flying today when the casket of the late Rev. Clementa Pinckney, who was killed in Charleston, passed it during a memorial procession. Flags and other official tributes to the Confederacy abound in the 11 states that fought against the Union during the Civil War; below is a catalog of such tributes with updates on what efforts (if any) have been made since Charleston to formally disavow them. Alabama: Alabama celebrates “Confederate Memorial Day” and governor Robert Bentley has, as recently as 2014, declared April to be “Confederate History and Heritage Month.” The state prohibits the defacing of any “object of veneration by the public or a substantial segment thereof” in the section of its state code that deals with flags, and it issues Sons of Confederate Veterans license plates. Its state flag is believed to allude to a design flown by state infantry groups during the Civil War. Four Confederate flags at a state Capitol memorial were taken down Wednesday on the order of Republican governor Robert Bentley. Arkansas: One of the blue stars on the Arkansas flag commemorates the Confederacy. (In 1987, then-governor Bill Clinton signed a bill, which had passed unanimously, reaffirming the flag design.) The state issues Sons of Confederate Veterans license plates and observes Confederate Flag Day in conjuction with Confederate Memorial Day and Arkansas Confederate History and Heritage Month. Georgia: In 1956, Georgia added an image of the Confederate battle flag to its state flag in response to federal integration orders. The state changed the flag in 2001 to involve a smaller version of the Confederate battle flag, then changed it again in 2003 to a design based on the Stars and Bars. The state issues Sons of Confederate Veterans license plates and celebrates Confederate Memorial Day and Confederate Heritage and History Month. On Tuesday, Republican governor Nathan Deal said the SCV plates need to be redesigned—like those of other states, Georgia’s SCV plates feature a battle flag—though he did not suggest that they should be eliminated altogether. North Carolina: North Carolina, which observes Confederate Memorial Day, hung a Confederate flag in its capitol in 2013 to commemorate the Civil War but removed it after civil rights leaders protested. The state issues Sons of Confederate Veterans license plates, though Republican governor Pat McCrory is currently calling for a change to state law that would allow the DMV to stop doing so. Florida: The state celebrates Confederate Memorial Day and prohibits the defacing of Confederate flags. In 2001, then-governor Jeb Bush removed a flag that included a Confederate symbol from the grounds of the state Capitol. Bush also declined to issue declarations commemorating Confederate History Month, which some of his predecessors had done, and his successors in office do not appear to have revived the tradition. Louisiana: Several Baton Rouge government buildings fly the Stars and Bars, which replaced the battle flag above said buildings in 1994. The state celebrates Confederate Memorial Day, prohibits desecration of the Confederate flag, and issues Sons of Confederate Veterans license plates. Mississippi: The state officially celebrates Confederate Memorial Day and governor Phil Bryant has, as recently as 2013, declared April to be Confederate Heritage Month. It prohibits the defacing of Confederate flags, and issues Sons of Confederate Veterans license plates. The state’s flag has incorporated the Confederate battle flag design since 1894. In 2001, the state’s voters rejected a new flag that did not incorporate Confederate symbolism. Some legislators have said in recent days they may propose a bill to eliminate the battle flag design from the state flag, and the state House speaker (a Republican) has endorsed such a move, though a new legislative session does not begin until January. South Carolina: South Carolina officially celebrates Confederate Memorial Day, prohibits the defacing of Confederate flags, issues Sons of Confederate Veterans license plates, and regulates who can wear Confederate “crosses of honor.” A Confederate flag flew above the South Carolina statehouse from 1961 until 2000, when it was moved to a monument elsewhere in the Capitol complex. Governor Nikki Haley has called for the flag to be taken down, which can only be done by the state legislature; many legislators publicly support Haley’s position, though no formal steps have yet been taken on the matter. The governing board of the Citadel, the state’s military college, voted Tuesday to remove the Confederate flag from a campus chapel. Texas: Texas celebrates Confederate Heroes Day. In 2011, the state rejected an attempt by the Sons of Confederate Veterans to sell a license plate featuring the Confederate battle flag, and last week the Supreme Court of the United States affirmed the state’s right to do so. “Texas is not willing to propagate the Confederate battle flag by etching that image onto state-issued license plates that bear the State’s name,” state solicitor general Jonathan F. Mitchell argued in briefs to the court. Virginia: A holiday called Lee-Jackson Day, honoring Robert E. Lee and Stonewall Jackson, is celebrated in Virginia. After Martin Luther King Day was declared a federal holiday in 1983, Virginia combined that celebration with Lee-Jackson Day into Lee-Jackson-King Day; in 2000, the state split the holidays back up. Virginia issues Sons of Confederate Veterans license plates, but Democratic Gov. Terry McAuliffe announced the state would phase out the plates. The state also issues a plate of Lee with the subtitle “the Virginia Gentleman,” but a spokesman for McAuliffe declined to discuss its future with reporters. For what it’s worth, laws prohibiting Confederate-flag desecration would likely be ruled unconstitutional in the event that any were actually enforced, which doesn’t seem to have happened in recent times. It should also be noted that in the aftermath of Charleston some official Confederate memorials—such as a statue of Jefferson Davis on the University of Texas campus and a bust of KKK founder Nathan Bedford Forrest in the Tennessee statehouse—have become subjects of controversy. But we decided not to discuss memorial objects in this post simply because there are far too many Confederacy-honoring official plaques, busts, and statues in the United States to have covered them in an article of readable length. Correction, June 27, 2015: This article previously said North Carolina removed the Confederate flag from its capitol in 2013. Actually, the flag in question only hung for a week in 2013 to mark the sesquicentennial of the Civil War.